SkinMedica takes skin care seriously, in fact it's all they do. Created by dermatologist and renowned "beauty industry visionary" Dr. Richard Fitzpatrick, the brand has recently added two new products to their already impressive lineup: an anti-aging serum and a redness relief lotion. Description: An all-in-one anti-aging product that combines antioxidants, peptides, and plumping ingredients with SkinMedica's patented growth factor serum, TNS Recovery Complex. What we think: The formulas are clearly separated in a dual-chamber pump that simultaneously dispenses a bright red gel and a creamy white lotion. The product has no noticeable fragrance, is not oily or greasy, and skin feels and goes on silky smooth after application. And it might just be wishful thinking but after about two weeks of use wrinkles do appear less obvious, plus I think my face looks smoother and fresher even at the end of the day. The directions state to apply it morning and night but be warned it's not a super-fast process -- the instructions call for dispensing the product onto the back of the hand and blending before applying, which isn't a big deal unless you're trying to speed through an already rushed morning routine. Description: "Save the red for your soles" by soothing redness at the source: the underlying inflammation. Key ingredients include CalmPlex, which works to inhibit vasodilation, and Vitamin B-3 (Niacinamide), which increases moisture retention and improves the skin's functioning as a barrier. What we think: The largely glycerin based lotion is heavier than expected, although not greasy. The first application tingled quite a bit, but according to the website that's normal and should lessen with continued use. It leaves skin feeling soft and moisturized, and although I don't have any particular issue with inflammation, my face does feel soothed as well. SkinMedica is available through a network of licensed physicians and medically supervised spas. Visit skinmedica.com for locations. 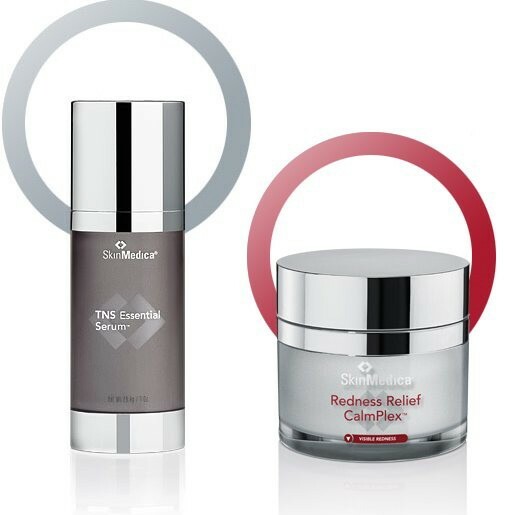 SkinMedica Launches New Anti-Aging and Redness Relief Skin Care Products originally appeared on Luxist on Wed, 13 Apr 2011 08:01:00 EST. Please see our terms for use of feeds.